In 1272, when Edward I came to the throne, Teignmouth was a thriving port, trading mainly in fish and salt and by the early 14th century it was second in Devon only to Dartmouth. It was significant enough to have been attacked by the French in 1340 and to have sent seven ships and 120 men to the expedition against Calais in 1347. However its relative importance waned from early in the 15th century as the demands on Devon’s ports diminished because Henry V was trying to build a Royal Navy so as to reduce the Nation’s dependence on merchant shipping. It did not figure at all in an official record of 1577. This may have been due to silting up of the harbour caused by the operations of the tin miners on Dartmoor. 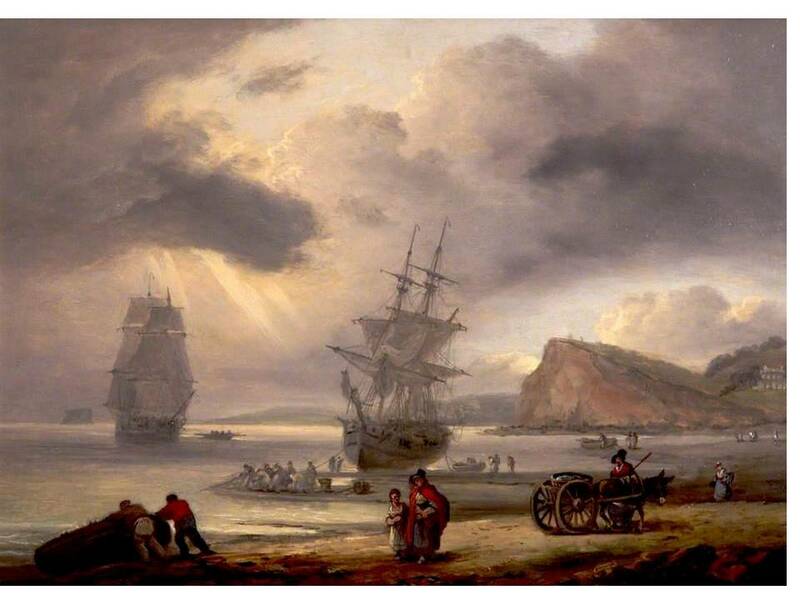 In the late 18th century, privateering was popular in Teignmouth, as it was in other Westcountry ports. In 1779 the French ship L’Emulation together with her cargo of sugar, coffee and cotton was offered for sale at “Rendle’s Great Sale Room” in the town. Teignmouth people also fitted out two privateers of their own: the Dragon with 16 guns and 70 men; and the Bellona , described as carrying “16 guns, 4 cohorns and 8 swivels”. The Bellona set sail on her first cruise in September 1779, and was “oversett in a violent Gust of Wind” off Dawlish with the loss of 25 crew members. The Newfoundland fisheries continued to provide the main employment into the early 19th century and as those fisheries declined the prospect of tourism arose. A tea house was built on the Den in 1787 amongst the local fishermen’s drying nets. The “Amazons of Shaldon”—muscular women who pulled fishing nets and were “naked to the knee”—were an early tourist attraction for male tourists. 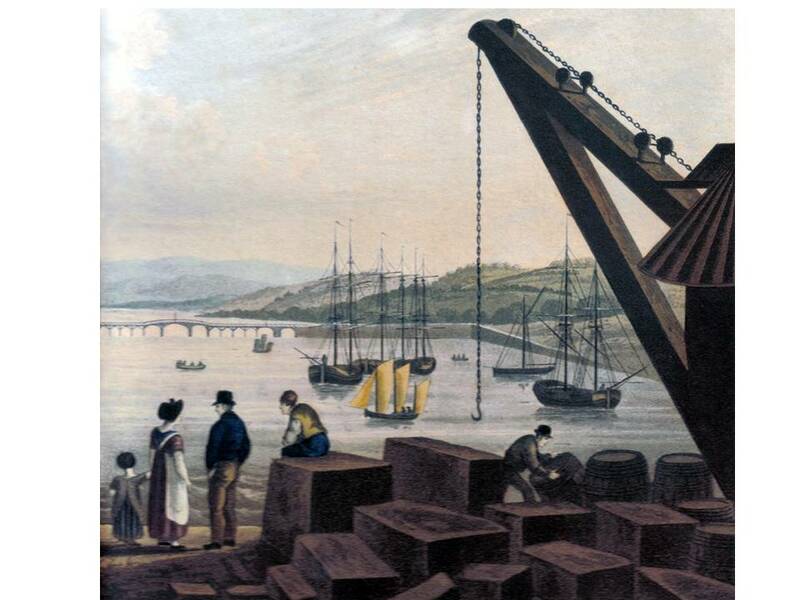 For a period in the 19th century Teignmouth was shipping large quantities of granite for use in construction in London (e.g. London bridge) and elsewhere. 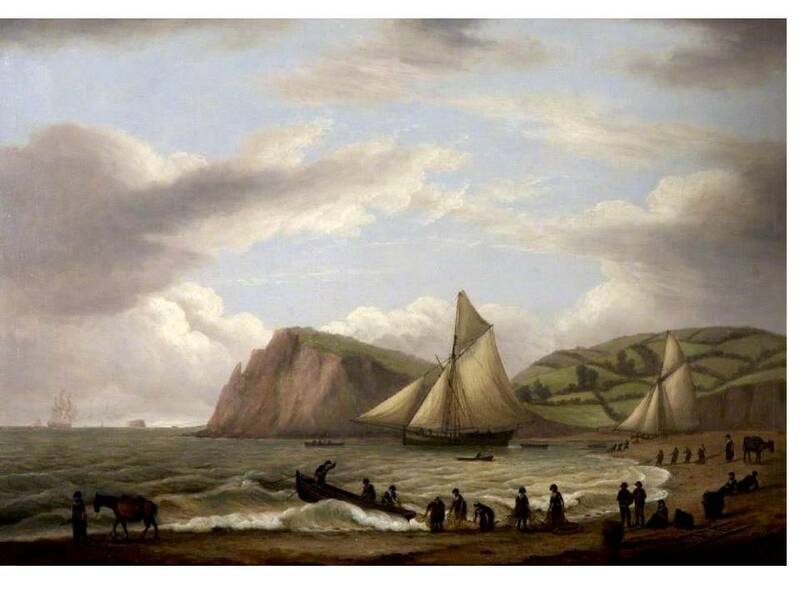 Teignmouth also has a long tradition of shipbuilding, from at least the 17th century. By the turn of the 19th century there were three shipyards in Teignmouth itself, and three in Shaldon and Ringmore on the other side of the estuary. The industry declined in the early 20th century, but in 1921 Morgan Giles bought the last derelict shipbuilding yard and gave the industry a new stimulus. His shipyard became a major employer in the town, building pleasure craft in peacetime and small craft such as torpedo boats during World War II. However the business eventually failed in 1968 not long after Donald Crowhurst’s notorious attempt to sail around the world. Teignmouth has successfully moved with the times and the changes in cargoes and by 2008 was handling more tonnage than it had done at any time in its previous history. It is equipped to handle most types of cargo ranging from bulks, mini bulks to palletised, unitised and general cargo. Its main export is ball clay, mined locally at Kingsteignton. Imports include animal feed, fertilizer, timber, building materials, stone and coal. In 2008 there were over 800 shipping movements a year handling more than 600 thousand tonnes of cargo. Seine nets were used in Devon for catching fish such as mackerel or salmon which swam in shoals. The bottom of the net was weighted, the rim having floats attached to keep the outer edge of the net on the surface. Many people are required to drag this type of net out of the water when full. The women of Shaldon and Teignmouth carried on a local fishing trade to support their families while the men were away in Newfoundland during the summer months. The trade too is considerable : the inhabitants are much engaged in the Newfoundland fishery. There are considerable exports of granite (for the conveyance of which from the Haytor quarries a railroad has been constructed), pipe-clay, potters’ clay, manganese, timber, bark, and cider: the imports are of culm, coal, deals, iron, &c. There is a considerable fishery for soles, whiting, turbot, mackerel, and pilchards, on the coast, and for salmon in the river Teign.